Push it just a little bit harder, originally uploaded by mike1727. 1 km in 42.6 seconds. Good start, but I faded badly at around 750m. Still, a good way to get the blood pumping at lunchtime, enough to get me on the leader board for a bit and plenty good enough for some team schwag- a pair of shorts and a shirt. The compost heap's gone critical. ., originally uploaded by mike1727. The compost heap is cooking away nicely- in fact it's steaming. 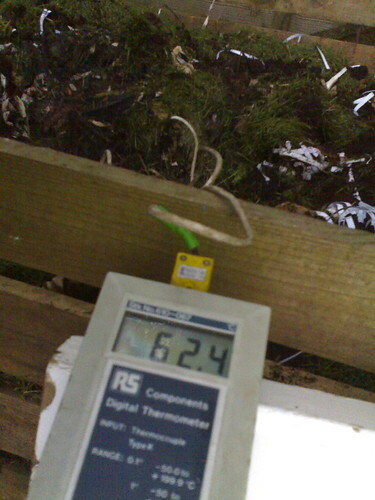 A quick probe registered temperatures around 62C in the centre of the pile- that's 143F, which is plenty hot enough to kill weed seeds and other nasties, and indicates that the carbon:nitrogen balance is about right. Cornell university has a page on composting physics which describes the temperature characteristics of decomposition. 1 large cup Garotta compost accelerator. No leaves this time, unlike previous loads. This was mixed together, on top of (but not mixed with) an already-composing layer of much the same material. No added water this time since the grass clippings were fairly moist.